1. Summarizing Data. 1.1. Characteristics of Water Resources Data. 1.2. Measures of Location. 1.3. Measures of Spread. 1.4. Measures of Skewness. 1.5. Other Resistant Measures. 1.6. Outliers. 1.7. Transformations. 2. Graphical Data Analysis. 2.1. Graphical Analysis of Single Data Sets. 2.2. Graphical Comparisons of Two or More Data Sets. 2.3. Scatterplots and Enhancements. 2.4. Graphs for Multivariate Data. 3. Describing Uncertainty. 3.1. Definition of Interval Estimates. 3.2. Interpretation of Interval Estimates. 3.3. Confidence Intervals For The Median. 3.4. Confidence Intervals For The Mean. 3.5. Nonparametric Prediction Intervals. 3.6. Parametric Prediction Intervals. 3.7. Confidence Intervals For Quantiles (Percentiles). 3.8. Other Uses For Confidence Intervals. 4. Hypothesis Tests. 4.1. Classification of Hypothesis Tests. 4.2. Structure of Hypothesis Tests. 4.3. The Rank-Sum Test as an Example of Hypothesis Testing. 4.4. Tests for Normality. 5. Differences Between Two Independent Groups. 5.1. The Rank-Sum Test. 5.2. The t-Test. 5.3. Graphical Presentation of Results. 5.4. Estimating the Magnitude of Differences Between Two Groups. 6. Matched-Pair Tests. 6.1. The Sign Test. 6.2. The Signed-Rank Test. 6.3. The Paired t-Test. 6.4. Consequences of Violating Test Assumptions. 6.5. Graphical Presentation of Results. 6.6. Estimating the Magnitude of Differences Between Two Groups. 7. Comparing Several Independent Groups. 7.1. Tests for Differences Due to One Factor. 7.2. Tests For The Effects of More Than One Factor. 7.3. Blocking - The Extension of Matched-Pair Tests. 7.4. Multiple Comparison Tests. 7.5. Presentation of Results. 8. Correlation. 8.1. Characteristics of Correlation Coefficients. 8.2. Kendall's Tau. 8.3. Spearman's Rho. 8.4. Pearson's r. 9. Simple Linear Regression. 9.1. The Linear Regression Model. 9.2. Computations. 9.3. Building a Good Regression Model. 9.4. Hypothesis Testing in Regression. 9.5. Regression Diagnostics. 9.6. Transformations of the Response (y) Variable. 9.7. Summary Guide to a Good SLR Model. 10. Alternative Methods to Regression. 10.1. Kendall-Theil Robust Line. 10.2. Alternative Parametric Linear Equations. 10.3. Weighted Least Squares. 10.4 Iteratively Weighted Least Squares. 10.5. Smoothing. 11. Multiple Regression. 11.1. Why Use MLR? 11.2. MLR Model. 11.3. Hypothesis Tests for Multiple Regression. 11.4. Confidence Intervals. 11.5. Regression Diagnostics. 11.6. Choosing the Best MLR Model. 11.7. Summary of Model Selection Criteria. 11.8. Analysis of Covariance. 12. Trend Analysis. 12.1. General Structure of Trend Tests. 12.2. Trend Tests With No Exogenous Variable. 12.3. Accounting for Exogenous Variables. 12.4. Dealing With Seasonality. 12.5. Use of Transformations in Trend Studies. 12.6. Monotonic Trend versus Two Sample (Step) Trend. 12.7. Applicability of Trend Tests With Censored Data. 13. Methods for Data Below the Reporting Limit. 13.1. Methods for Estimating Summary Statistics. 13.2. Methods for Hypothesis Testing. 13.3. Methods for Regression With Censored Data. 14. Discrete Relationships. 14.1. Recording Categorical Data. 14.2. Contingency Tables (Both Variables Nominal). 14.3. Kruskal-Wallis Test for Ordered Categorical Responses. 14.4. Kendall's Tau for Categorical Data (Both Variables Ordinal). 14.5. Other Methods for Analysis of Categorical Data. 15. Regression for Discrete Responses. 15.1. Regression For Binary Response Variables. 15.2. Logistic Regression. 15.3. Alternatives to Logistic Regression. 15.4. Logistic Regression for More Than Two Response Categories. 16. Presentation Graphics. 16.1. The Value of Presentation Graphics. 16.2. Precision of Graphs. 16.3. Misleading Graphics To Be Avoided. References. Appendix A: Construction of Boxplots. Appendix B: Tables. Appendix C: Data Sets. Appendix D: Answers to Exercises. Data on water quality and other environmental issues are being collected at an ever-increasing rate. In the past, however, the techniques used by scientists to interpret this data have not progressed as quickly. 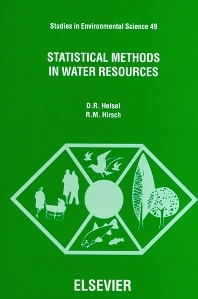 This is a book of modern statistical methods for analysis of practical problems in water quality and water resources. The last fifteen years have seen major advances in the fields of exploratory data analysis (EDA) and robust statistical methods. The 'real-life' characteristics of environmental data tend to drive analysis towards the use of these methods. These advances are presented in a practical and relevant format. Alternate methods are compared, highlighting the strengths and weaknesses of each as applied to environmental data. Techniques for trend analysis and dealing with water below the detection limit are topics covered, which are of great interest to consultants in water-quality and hydrology, scientists in state, provincial and federal water resources, and geological survey agencies. The practising water resources scientist will find the worked examples using actual field data from case studies of environmental problems, of real value. Exercises at the end of each chapter enable the mechanics of the methodological process to be fully understood, with data sets included on diskette for easy use. The result is a book that is both up-to-date and immediately relevant to ongoing work in the environmental and water sciences.